Age-gating is a feature on Instagram that restricts under-age individuals, in other words minors, ability to access to pages which belong to brands and other people who share content and are operating within industries that aren’t for minors. The most common example of industries whee age-gating on Instagram is used is in the alcohol industry. With this feature alcohol brands can restrict under-age people from accessing their content and thus prevent them from being influenced by their promotional content. If you’ve visited an alcohol page on Instagram before, you know that almost all of them have something about age in their bio. 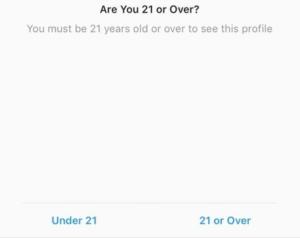 Even if this is a good way to inform under-age individuals that they have to be 21+ to visit the page, it doesn’t make a huge difference, if any, among the people who actually are minors. How many under-age individuals do you think are turning around when reading that bio thinking ”oh, I am not allowed to be here”? Those who are under-age can still access these pages and their content without any problem. It’s just a way for the alcohol brands to set themselves free from the responsibility and be able to say that they’ve done their best to inform minors. There are, however, brands who want to take it one step further, and this is where the age-gating on Instagram comes in handy. How can Instagram know your age? Instagram does not know what age you are, but after Facebook bought Instagram on April 9th 2012, the ability to connect your Instagram account with Facebook account was introduced. Because you write in your birthdate when you create your Facebook account, Instagram can now know what you age you are, when you connect your Facebook account with your Instagram account, and this is what Instagram bases your age on. Now, you might be thinking ”But what if I haven’t connected my Facebook account to my Instagram?” and ”what if I lie about my age on Facebook?”, and I am just about to get into that. There are three scenarios that can happen when you visit an age-restricted Instagram page. As you can see here, you have to choose one of the above options. If you choose “under 21” you’ll be denies access to the page, if you choose “21 or over” you’ll get access to the page an be able to view all of the posts just like on any other account. Thirdly. If you have connected your Instagram with your Facebook account and set the age above the required limit to access an age-gated Instagram account, you’ll be let in without any control questions, and you won’t even notice the age-gating feature on Instagram is actually there. 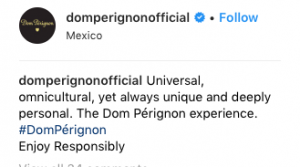 In addition to activating age restriction on Instagram, many alcohol brands take a great responsibility. They write ”Drink responsibly” in their profiles, they write ”Not intended for persons under the legal alcohol drinking age or in countries with restrictions on advertising alcoholic beverages”, and furthermore, they write disclaimers in the captions for each post they share. Age-gating is optional for brands on Instagram. There aren’t a lot of industries which demand you to be a certain age to purchase their products. Those industries are mainly alcohol and tobacco, and since tobacco brands are virtually non-existent on social media due to them being much more regulated than alcohol, the main industry with age-gating on Instagram you’ll see will almost solely, if not completely entirely will be alcohol. If you wish to activate age-gating on your own Instagram account, you need to contact your account representative and ask them to enable it on your account. There is no built-in feature on Instagram which enables you to simply go to your settings and activate age-gating on Instagram, and the simple reason is that if you look percentage wise of Instagram’s total users, the percentage of accounts on Instagram which need the age-gating feature is minimal, and therefore, it doesn’t make sense to incorporate a new feature in the settings just for that. If your brand has legal obligations, (posting content that isn’t meant for under-age followers), you should consider taking a look at the law to see what it says in your country. If you have no account representative, contact Instagram directly to seek help from there. If you activate the age restriction on your account, Instagram will automatically remove all existing followers of your account who are under-age so you might be experiencing a high follower loss if you do this. Operating in an industry which doesn’t allow you to advertise to minors and highly restricts your advertising is obviously tricky. Of course, we’re talking mainly alcohol brands here, and if you take a look, essentially all alcohol brands have an account on Instagram due to the fact that it has proven just how effective it is in marketing. But while age-gating is a great way for alcohol brands to do everything they can, studies have found that the advertising efforts that alcohol brands make on social media, both paid and organic results in reaching minors. The study found that people of 13 years of age were “inundated with daily ads” from the alcohol industry on social media platforms. This was referring to paid advertising, and as for paid advertising, the platforms themselves have age-gating which are meant to ensure that the pad ads don’t reach any individuals who are under-age, but based on what I said earlier about the ability to lie about your age etc, ads from alcohol brands will obviously be served to minors – despite age-gating. A spokesperson for Instagram clarified that Instagram had implemented age-gating measures in April 2015, saying “We’re committed to making sure that our platform is safe for young people”. Today, you’re required to be at least 13 years old to use Instagram. As for paid advertisements on Instagram, the advertising technologies go Instagram’s parent company Facebook, is used for ad serving, and in this, technologies are developed to ensure that ads will be shown to people who have identified that they are over the legal drinking age in their country. As such, this means that the Instagram age-gating won’t show ads from alcohol brands to individuals who are under-age, but it won’t show ads to individuals which they don’t know the age of. The catch is that this leaves them with one group of under-age individuals left, and these are the people who have lied about their age when creating an Instagram/Facebook account. All of these actions are steps in the right direction from Instagram for protecting under-age children from promotional content from alcohol brands, but the features that are available aren’t really groundbreaking security measures. It’s not only alcohol brands that can activate age-gating on Instagram. In fact, there might be other reasons that you want to activate it as well. Activating age-gating on Instagram is, while not surefire, a great way to stay in line with regulations about industries which aren’t allowed to sell to minors, but also to prevent them from accessing your content and being influenced by it. Do you know the exact instructions on activating the age gate on instagram? More precise instructions would be insanely helpful! It’s easy! Just “contact instagram” haha! Suuuuuure…. Haha, while it is difficult, it’s not impossible:) You just have to be VERY consistent. Any tips on reaching and IG rep? Reaching Instagram is not the easiest thing. 1.Go from your profile and tap “Settings”, “Help, find the issue you have and follow the tips they have. 2.Tap in the top right corner of your profile and tap “report problem”. Then tap “General feedback”and write a message to them. Thanks! Canada’s cannabis industry requires age-gating content and its great to know this is possible to do on social media! Glad you found the article helpful, Nichole!